Beyond portable grills and parking-lot touch football, tailgating season often means coolers filled with one or two six-packs of good beer along with a slew of fairly tasteless cheap stuff. After drinking through the craft-brewed IPAs and seasonal porters, don’t despair. Tasteless beer can be rescued. While in college, yours truly survived by always having a bottle of Rose’s lime juice on hand—a couple of drops will make any canned swill potable. Here, expert bartenders share their bad beer upgrades. Streamlined Micheladas: The spicy, citrusy Mexican beertail can be made with additions that range from soy sauce to worcestershire sauce, plus spices. In San Francisco, Wingtip bar manager Brian MacGregor regularly makes a super speedy version with the limited contents of his fridge. “Cheap beer, two limes and a bottle of hot sauce—you’ve got 16 quick Micheladas," he says. Whiskey as a mixer. Jared Mort, the general manager at Sassafras in Los Angeles, adds smoky, peaty, but not super expensive Scotch like The Black Grouse to beer in order to create the illusion of depth. Kevin Diedrich of Jasper’s Corner Tap & Kitchen in San Francisco has a secret boilermaker technique: “I punch a hole in the can, pour a little out, and then pour a little whiskey into the hole,” he says. Then he shotguns the beer. “Of course, this is done in the most responsible way possible,” he adds. Rum-beer-itas. Bartender Ed Hackett and the rest of the crew at The Diving Horse in Avalon, NJ created the Staff Drink. 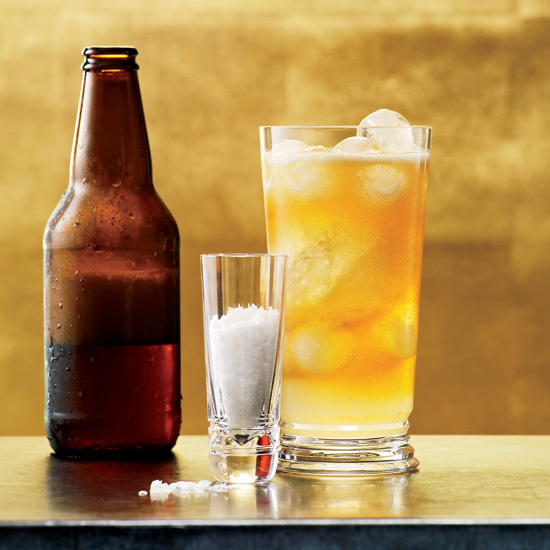 “Take a Coors Banquet beer, pour over ice (you can salt the rim of the glass if you like), add a shot of dark rum (preferably Mount Gay), and a squeeze of fresh lime. It’s surprisingly delicious,” Hackett says. Coffeetails. “If you like chilled coffee, but want an extra kick to it, I highly recommend Maui Brewing’s Coconut Porter,” says Fifth Floor's Means. “Just do a fifty-fifty mix of coffee and beer to put a little pep in you step.” Of course, Maui Brewing doesn’t actually require any upgrade—it’s great on it’s own. Means also suggests trying the trick with mass-produced beers—but only if you brew an extra-strong pot of coffee.